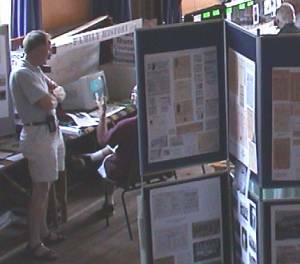 Held in the Wedmore Village Hall from June 29 to July 1 2000, the Wedmore Local History Exhibition attracted worldwide interest, with visitors from as far afield as North America. 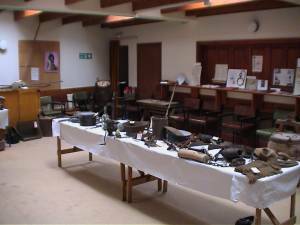 There was a wide range of exhibits, with local history information, ranging from the village's Saxon past through to more recent times. An exhibit that was of particular interest to the children of the local village school was the school's punishment book, which was loaned to the Exhibition by local historian Hazel Hudson, who played a key role in setting up and running the event. This detailed the punisments received by children and the acts they had carried out to receive their penalties. (Inevitably) Larders were listed for committing such misdemeanours as "bad behaviour in class" and "throwing lighted matches at girls on way home". The children seemed quite amused by the behaviour of children 80 years ago but frightened of the idea of receiving strokes of the cane across their bare hands! 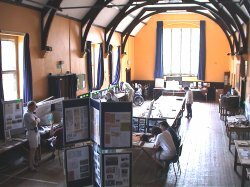 The picture on the right shows the main display area of the hall, with the main entrance door at the centre of the left hand wall. Entering the hall from the main door and turning left led visitors chronologically through the historical development of the village. The great advantage of an exhibition of this type is that local people can provide real history of the people and their tales which can never be found in text books. Many of the exhibitors would probably consider World War I to be relatively recent history. However, to the children of the local junior school events that took place more than 80 years ago are practically pre-historic. 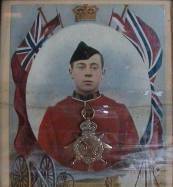 These photographs show just a small part of the World War I display. 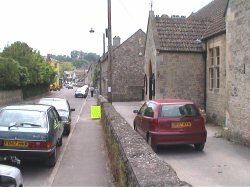 Agriculture has played an important role within the development of the The Isle of Wedmore. A complete room within the exhibition was set aside for the agicultural display. For many visitors, like us, family history research was the principal purpose of the exhibition. 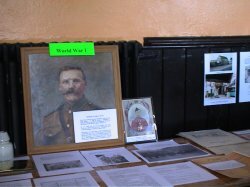 The picture on the right shows the Family History display run by George Steer, who is a keen local family historian, having had a close assocation with the village since 1965. He has provided invaluable help to many people worldwide who are tracing their ancestry.